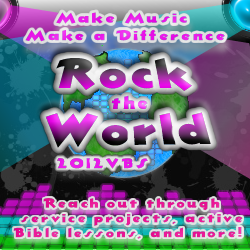 About the Children's Department: Top Five VBS Countdown 2012 - Rock the World from NextGen4Christ! Top Five VBS Countdown 2012 - Rock the World from NextGen4Christ! Today I'm happy to announce my fourth place VBS for 2012 . . . Rock the World from NextGen4Christ! You may not be familiar with NextGen4Christ as they are a fairly new VBS publisher, but they did a great job with the content and substance of this VBS resource. Take a look and consider if Rock the World is a good "fit" for your children's ministry! Love like you mean it - Luke 2:1-18 - Jesus leans on God and prays to create food for 5,000 people! Belong - Acts 2:42-47; I John 2:28; 3:1-7 - Jesus lives in the hearts of His children/church to change the world! Message – Kids learn on their tour how Jesus gave up heaven to shine on Earth, how he leaned on God to feed 5,000 people, how he didn’t back down when the Pharisees accused Him of healing on the Sabbath, how he defeated sin by dying on the cross, and how anyone can belong to the church and change the world! I love the “Pic a Challenge’ kids are sent home with each day on a “guitar pic” – I also love the focus on engaging kids in thinking about what they learned and doing something to live it before they return the next day! Bible lessons are active and engage children throughout the lesson! Music is from Hillsong Kids – great music for children’s ministries to use beyond VBS! Excellent info to help you include children with special needs! Director’s information is complete – just need some information on safety for your facilities and emergency info. NextGen4Christ says, "We remind kids every day the reason we love others is because Jesus loved us first. Our Bible stories are from the life of Jesus and the early church, and our Bible points are based on I John. Every child makes a difference! Whether it is by potting plants for hospital patients, but cleaning up the city park or by writing letters to children worldwide, kids get to rock the world!" Overall, Rock the World is a great option for a VBS with a strong focus on serving so if you are looking for a resource to engage kids in serving; this is well worth taking a serious look at it to see if it is a good “fit” for your ministry. Since all the student materials are reproducible, you could easily use this resource for mid-week during the school year, during a week-long missions conference or for a month of missions focus – match the projects you have the kids work on to fit with your missions emphasis/missionaries.